AW Rostamani Group founder and Chairman died in Dubai on 3rd November 2016. Over the years, AW Rostamani Group, have grown from strength to strength and the Group is now made up of 17 companies with more than 3000 employees. The Group celebrated its 59th anniversary this year in 2016. My personal association with Mr. Abdul Wahed Hassan Al Rostamani goes back to 1979, the year I landed in Dubai as the Accountant of Thomas Cook Al Rostamani , a joint venture formed by Thomas Cook, the largest Travel and Foreign Exchange company in the world then and the legacy Al Rostamani Group which subsequently because two separate entities in the year 2006 ( Al Rostamani Group and AW Rostamani Group) I was the first staff of Thomas Cook Al Rostamani , being transferred from the Bahrain Regional Office of Thomas Cook Group Ltd. 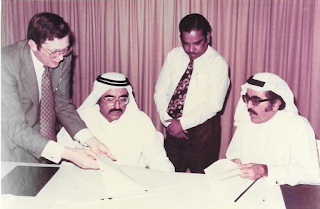 I worked for Al Rostamani Group until 2006 (27 long years) , the year we established DULOG LLC , a Company founded by Mr. Khalid Al Rostamani, son of Mr. Abdul Wahed Al Rostamani and myself which later was re-organized as KAR Freight & Forwarding LLC., and DULOG LLC. 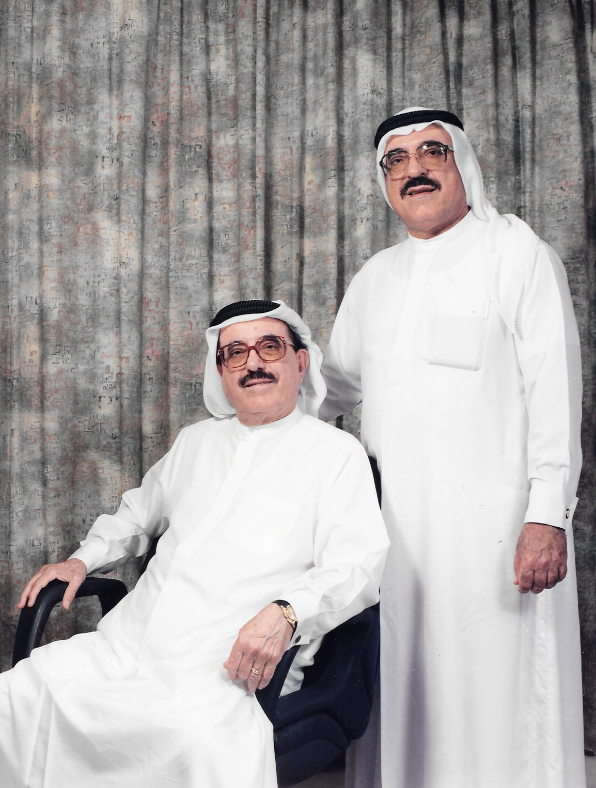 In spite of being one of the greatest achievers among the Emiratis in the UAE, with Forbes rating him as 60 out of the top richest Arabs in 2014 and earlier this year, being ranked 28 on the annual world billionaires list, I have never seen in my life a more humble, simple and hardworking billionaire in my life and in spite of all the wealth, power, fame and achievements on his stride, he was an extra-ordinary caring and down to earth human being and a devote Muslim. There are several measures he took part of his supreme submission to Allah and for the fear of Allah’s wrath. One step I remember was his instructions to all his Companies General Managers that nobody should entertain anybody, whether Internal Customers or External Customers, Partners, business associates etc., on Company’s account, serving alcohol. 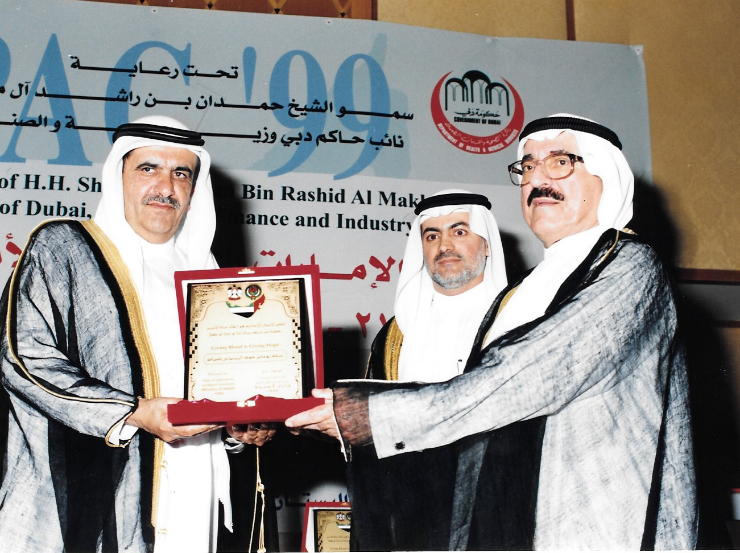 The proudest moment of my life, associated with Mr. Abdul Wahed Al Rostamani, personally was when I went to the podium of the Dubai Quality Award Function , held in Dubai, along , with him , in the year 2004, to receive the Dubai Quality Award for the year 2003 , for Thomas Cook Al Rostamani Exchange Company ( now known as Al Rostamani International Exchange ) from HH Shaikh Mohammed Bin Rashid Al Maktoum, Vice President and Prime Minister of UAE and Ruler of Dubai. Inna Lillahi Wa Innah ilaihi Rajioon ( To God we belong; to God we return). May Allah grant him Jannathul Firdaus (Highest part of the Paradise) and grand him Maghfirah (forgiveness)... Aameen. PHOTOS OF Abdul Wahed Hassan Al Rostamani, from the private collection of Niyaz Ali, Managing Director, DULOG and former General Manager of Thomas Cook Al Rostamani Exchange Company. 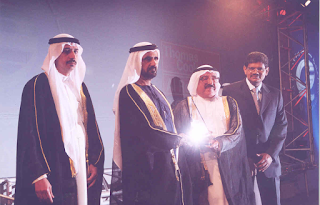 Abdul Wahed Hassan Al Rostamani receiving award for the various Blood Donation Campaigns conducted by Thomas Cook Al Rostamani Exchange Company ( now known as Al Rostamani International Exchange Company). Abdullah Hassan Al Rostamani and Abdul Wahed Hassan Al Rostamani , signing the joint venture agreement between Al Rostamani Group and the Thomas Cook Group covering the formation of the Company Thomas Cook Al Rostamani , in 1979. Seen also in the picture are T. M. Nair, Director, Al Rostamani Group and Frazer Legg of Thomas Cook Group. 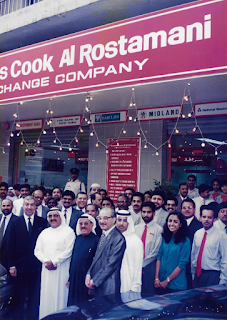 Abdul Wahed Hassan Al Rostamani with Abdullah Hassan Al Rostamani , Khalid Al Rostamani, Michel Ayat, CEO Automotive Group, AW Rostamani Group and Senior officials during the inauguration of the renovated Deira Baniyas Square Branch of Thomas Cook Al Rostamani Exchange ( now known as Al Rostamani International Exchange).